It’s the same opposition, but there’s a different prize at stake when Ben Mee’s former club Leicester City arrive at Turf Moor this time. Just three points separated the pair in March last year in the chase for the Championship title, though goals from David Nugent and Chris Wood handed the advantage to the Foxes. On this occasion, 13 months later, the gap is as narrow as two points in the scrap for Premier League survival. 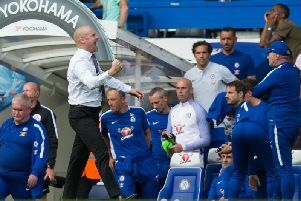 Three successive victories for Nigel Pearson’s men saw them climb off the foot of the table at the expense of the Clarets, who have now won once in 12 outings. “There’s no nerves, I’m just excited for it,” said Mee. “You play football for these big games. It’s going to be interesting as the season comes to an end. The full back, who spent five months with the Foxes in 2011 under the stewardship of Sven-Goran Eriksson, making 15 appearances, added: “There’s a different prize at stake and it’ll be a completely different game. “It was a bit of an odd game last year - we lost Sam (Vokes) early doors and we didn’t recover from that. I’m looking forward to it. Meanwhile, the 25-year-old reflected on the good, the bad and the ugly points of a 1-0 defeat to Everton at Goodison Park last weekend. Tom Heaton’s penalty save to deny Ross Barkley was the highlight, Ashley Barnes’s dismissal for two cautions proved the lowlight while the result was particularly unsightly. “It was close but the performance wasn’t there to be honest, even before we went down to 10 men,” he said. “We’re disappointed but there’s a big game coming up and we’ve got to pick ourselves up and go again. “We kept our shape really well but we couldn’t create enough chances to equalise. “It was a really good save from Tom. You can rely on him to pull out those saves. “He’s done really well again for us but it’s a shame we couldn’t back it up and go on and get something out of the game. On Barnes, who will serve a one-match ban tomorrow, Mee added: “You pick up bookings for nothing now. That’s the way it is. “He knows he didn’t need to commit to the second one and he’s as disappointed as everyone but he’ll learn from it.